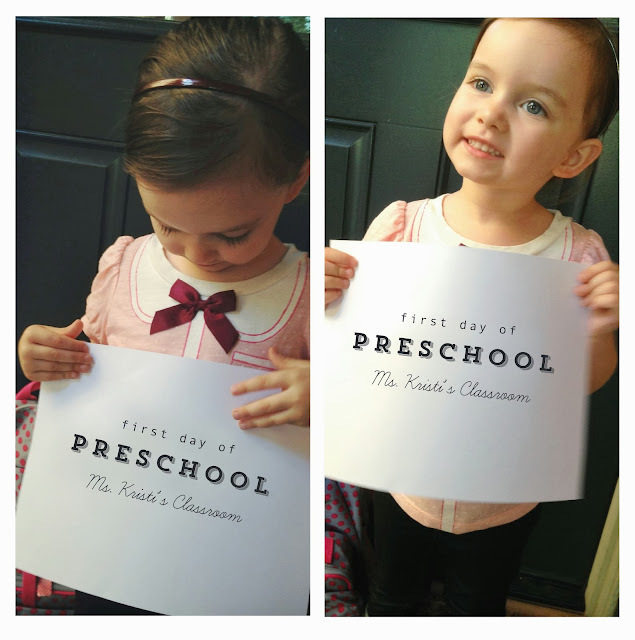 Reegan started preschool this year at Joy Christian Preschool on August 12th...which also happened to be the day of her 3rd birthday. What a busy time that was for our family. We had just celebrated Daddy's 30th birthday, had a party at home for Reegan's third birthday and visited with our CO uncles that were in town. 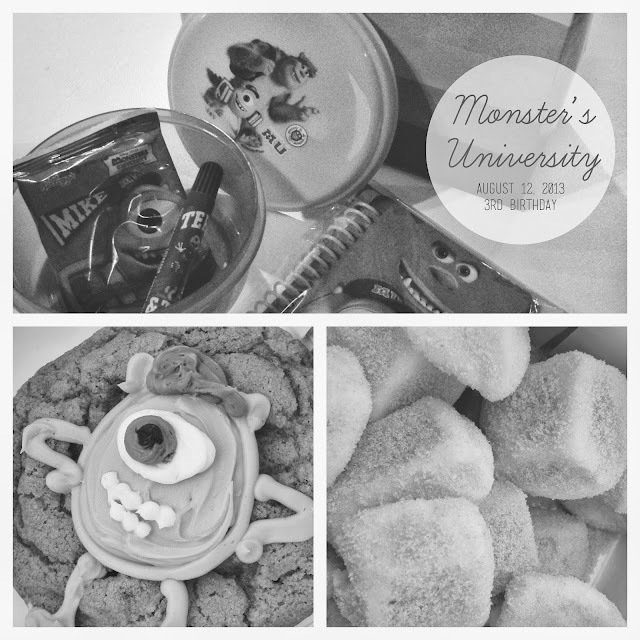 THEN I prepared everything for the first day of school and "had" to make Monster's University favor bags/treats (AKA ordered mini treats from PB Bakery) for all the kids in class. I put together cute little Monster's University bags (she loves this movie and I thought the theme was fitting LOL!) with notebooks, markers and fruit snacks in tupperware bowls for all her new classmates. As I mentioned I ordered mini treats/chippers for the kiddos. 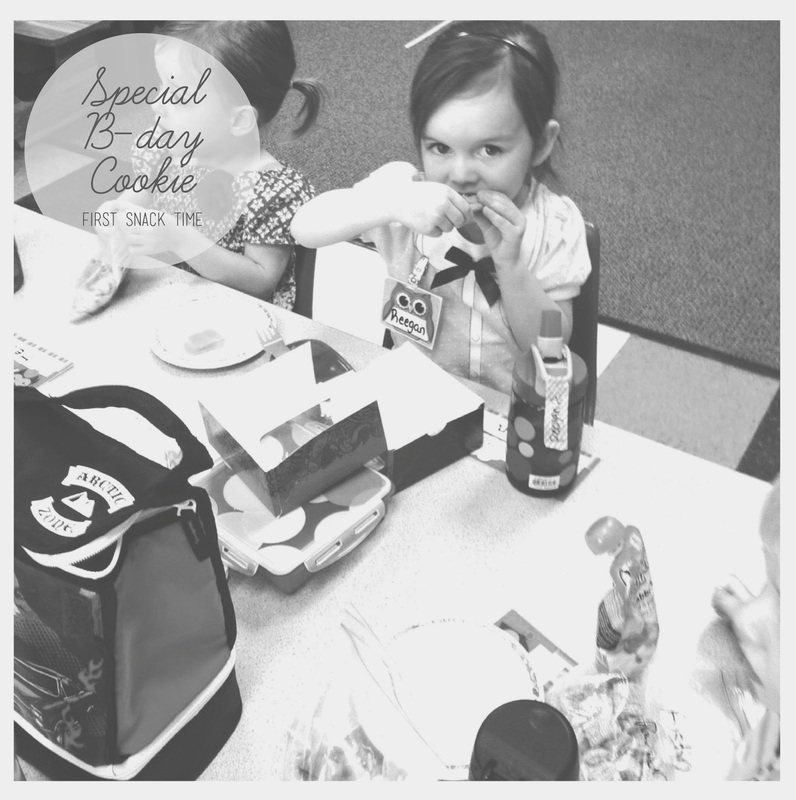 I found out by chance that the lady taking my order had a daughter in Reegan's class...small world experience ..and she was kind enough to make a special birthday cookie for Reegan. I literally almost cried about that sweet gesture. Preggers hormones a flaring here people! 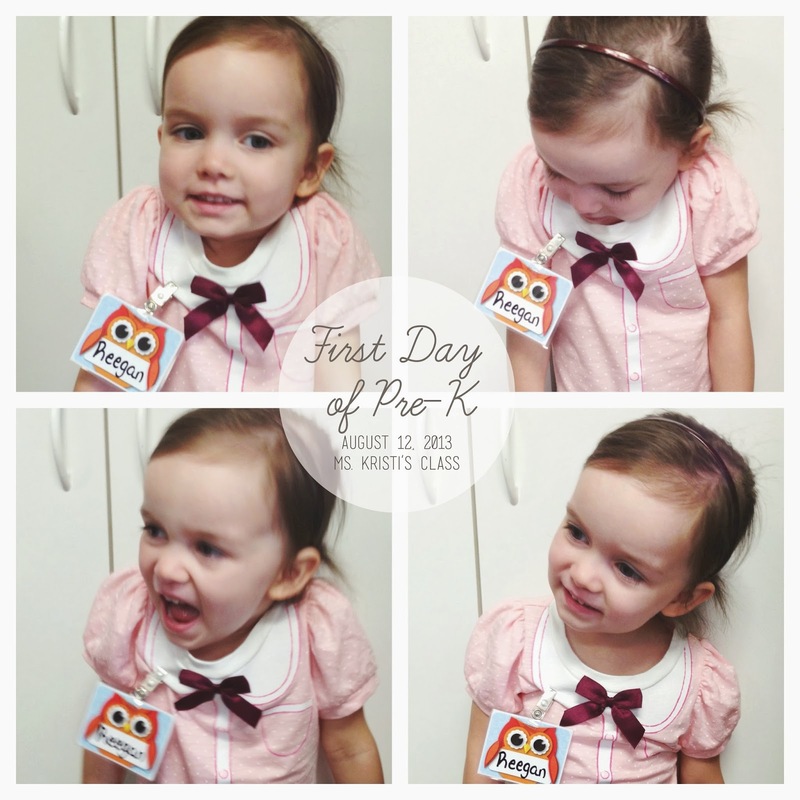 But I did hold it together at drop of her first day. So yay...for mommy on that one. What a wonderful year of celebration! 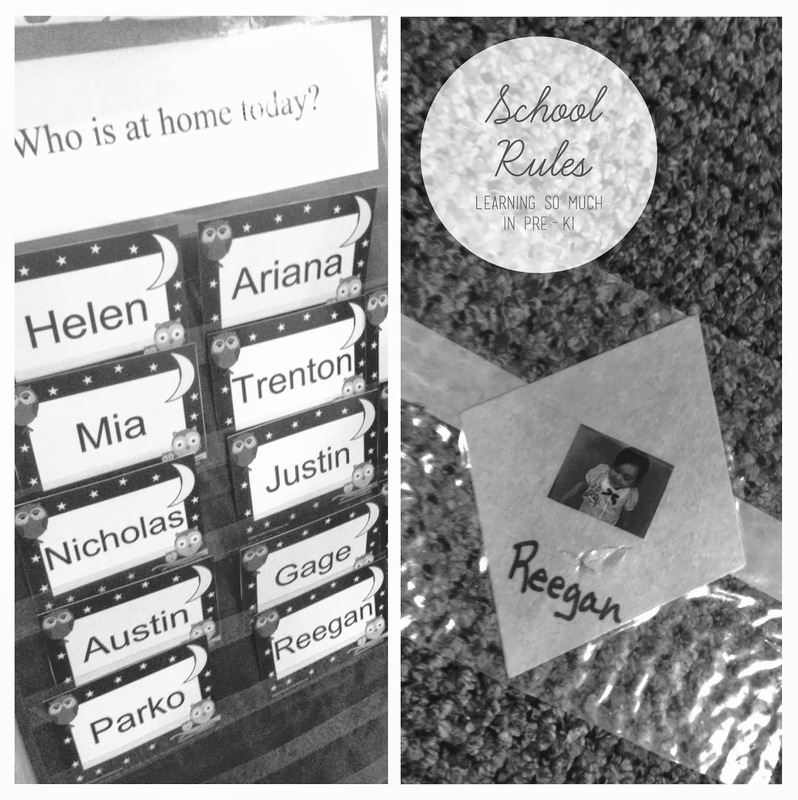 So let's talk a little more about Reegan in school. First day included birthday celebration as mentioned above and we kicked off the day with the obligatory sign + front door on first day of school pic...I might have to redo this...looking back I should have done a full body so we could see how much she grows in height by the end of the school year. I am "that parent" that probably texts the teacher too much. Ms. Kristi was kind enough to send me a picture of Reegan eating her special Mike Wazowski cookie on the first day...talk about making this mommy happy with getting a sneak peak into how her first day was going. 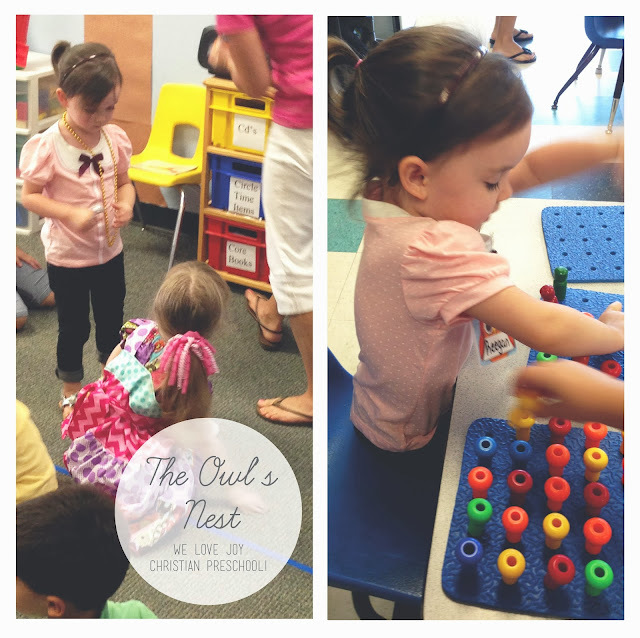 We insanely love her preschool and couldn't be happier with the results we already see from her being in a school environment. Reegan has to check in everyday which means find her name tag and move it from the Out to In chart. We place her water and lunchbox in the proper place. We sign in and she's off to the playground. At pick up she has to wait in her spot (a little diamond for my girl that sparkles) on the rug until we sign her out. Then she collects her water, lunchbox and checks her cubby for things to take home. Her classroom is the Owl's Nest...I love every little owl thing I see even more now! I of course DIE for the projects that she brings home and started a little school corner in her room. I love hearing her say things like, "I had so much fun today!" and important lessons like, "God doesn't like us to steal." Makes me giggle but in all seriousness I'm glad that we have an additional resource in helping us establish the rights and wrongs in life, education and God all in one wonderful little package. There are so many awesome events going on in our life thanks to Joy. We had a special Luau welcome event, the extra birthday celebration, an annual auction, a Pumpkin Palooza event and so much more. God TRULY blessed us with this amazing place that our daughter spends her time at when away from home. Lots more to come on Reegan and school and if you don't get enough here check out my Insta feed which has full coverage! LOL! I'm bad I know.